In the seas around New Caledonia, geomorphological features of the seafloor (e.g. banks, atolls and seamounts) are sites of outstanding marine biodiversity, studied by local research initiatives such as the ZoNeCo program to assess the living and non-living marine resources of New Caledonia, and by the Institute of Research for Development in Noumea and the National Museum of Natural History in Paris. Within the framework of cooperation between the Government of New Caledonia and Conservation International, a partnership agreement was signed with the French Marine Protected Areas Agency to identify the geomorphology of the New Caledonian seafloor. Ralf-D. Schroers from Spatial Ventures was contracted by Conservation International to develop a geomorphological classification and conduct an analsyis of the geomorphology. 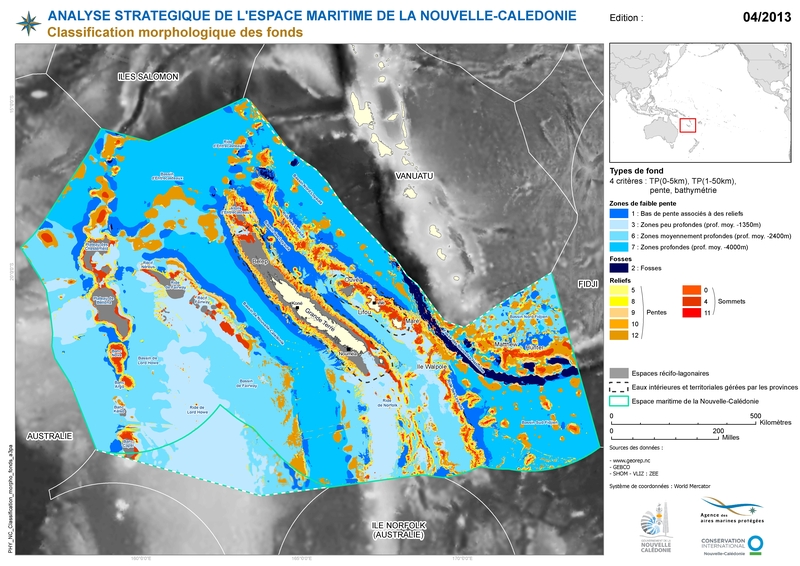 Geomorphology of New CaledoniaThe geomorphologic maps are a first step towards the characterisation of the marine ecosystem, as part of a strategic analysis of the New Caledonian exclusive economic zone (EEZ) for creating a “Coral Sea” Marine Park. The geomorphological analysis of the EEZ was primarily based on bathymetry (depth) data with a resolution of 500 m supplied by the DTSI. two indices of Topographic Position Index (TPI) - representing the second derivative of bathymetry data (change of slope). The broader-scale TPI with an annulus of 1 to 50 km helped identify the larger seamounts, depressions and plateaus. The finer-scale TPI between 0 to 5 km identified smaller features, such as thinner canyons, valleys and ridges. The last grouping of higher relief classes were further classified into mountainous features (distinguished by relative heights) as seamounts (>1000 m), knolls (500 to 1000 m) and hills (<500 m), according to the standardization of undersea feature names used by the International Hydrographic Organisation and the Millennium Coral Reef Mapping Project.